Image of mayoral candidates profiled by dandyhorse for the municipal election. Well dandies, it's been a long campaign and a busy fall season, but the election is finally upon us. 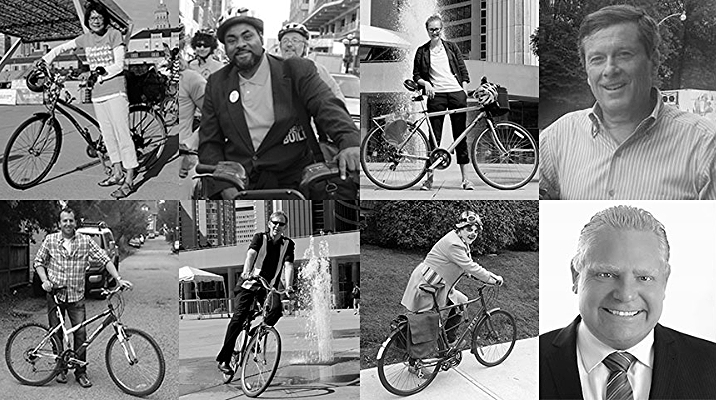 If you're still trying to make up your mind about which mayoral candidate is right for you (in terms of bike policy), you can check out our handy dandy candidate profiles. Just be sure to get out there and vote! This newsletter has great stories about Bike Spotting on King, news about the Pan Am Path, Jenna Campbell continued to explore the city's bike lanes as a new cyclist on Harbord and Shaw streets and ward 20 council candidate Albert Koehl wondered if we are placing more importance on parking spots than on pedestrian and cyclist safety.